The same daily bus ride can take different characteristics when different music plays through your speakers. Today I am sitting on the back of the bus, next to an aged man who is trying to get some sleep while we go through one dirty city to another. 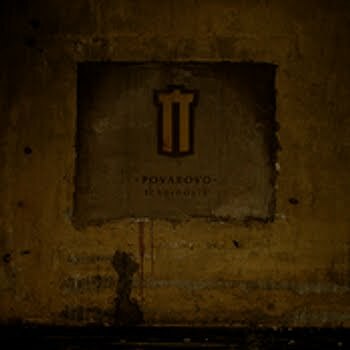 I watch the window to the music of Povarovo, who plays a range of instrumental tracks that creates a gloomy, jazzy translation to my surrounding. The track “Hopen Dead” catches me while the bus stands still in heavy traffic. It’s raining and I am staring at another driver who sits in his car and hopelessly waits for the car in front of him to move. The music reminds of Yann Tiersen’s music, only it emphasizes a more burdened side of reality. I watch the man in his car, I hear the painful, yet charming piano playing, and this beautiful music even gets a free percussion section from the beating rain, that seems to know the exact pace and rhythm to fit into the composition. My Song2224 kicks in and in a more melancholic and slightly heavier atmosphere. I think about dark, smoky pubs in forgotten alleys, but the only smoke I see (Thankfully, not breathing it right now) comes from another passing bus. The music compensates for this lack of exterior sensual provocations and sends me to a different world with the ideas it projects. The bus ride is dull and gray, yet it is brought into life by the soundtrack I am listening to. Pro Romance gets a more dramatic, martial direction, and at this exact point the rain stops and gives way to the sound of furious truck drivers who argue among themselves in the middle of the road. The album continues and suggests more musical moments that give hints about other experiments with music, that goes wrong and affect my reality. I hear the heavy breathing of the other passengers through ’66 Breath’, and on ‘Never Boiler’ there is a strong notion of a well aged film noir going on around me. I hear distant echoes float as I leave the bus and get my feet on the pavement. The dramatic pace of the fourteenth track, ‘Black Powder’, causes my walk to be faster and feeds my paranoia with intense shrieks. It ends, and what I thought to be a short, jazzy display of power ends as a more experimental and furious album. On the press sheet I got from Denovali they said it’s “time to immerse”. Frankly my dear, I don’t see any other option.